Choosing to send your parcel to Canada with DPD Local Online means that you’re putting your parcel in safe hands. 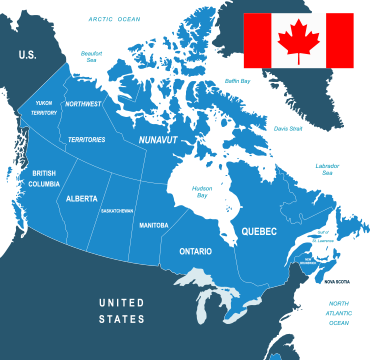 With coastlines on the Pacific, Arctic and Atlantic oceans, Canada literally stretches ‘from sea to sea’; the majority of its vast landmass being dominated by forest and tundra. Consequently, most of its population is concentrated in cities along the southern border; its largest metropolitan areas being Toronto, Montreal and Vancouver. Thankfully, our extensive parcel courier network means that arranging postage to Canada is hassle-free no matter which coastline you want to send a parcel to. Our expertise in international courier delivery also means that we can arrange your parcel delivery in the most efficient way possible whatever you’re posting to Canada. With our express and economy delivery options, posting to Canada can be very cost-effective whether you’re sending your parcel to the bright lights of the big cities, or to the moose-inhabited forests of the north. To arrange your postage to Canada, get a quote today.